Like many Brits, I have been away for a couple of weeks this month. But I did do some work honest! About a month ago I was approached to put a mixed dried flower wedding bouquet together for a bride who had been let down by her florist. I put together the bouquet shown above for £30 and she was really pleased, and is going to send a wedding photo when she gets back from honeymoon. Another bride wrote to tell us how she had happily used the £9.99 dried flower bouquet made in a previous blog post as a bridal bouquet. So it’s not really surprising that the media is becoming interested in dried flowers. This month I’ve been approached by one of the leading wedding blogs to do a dried flower wedding bouquet make, and I’ve been writing a piece for a craft magazine about why dried flowers are back in fashion. I had a great time looking round Cambridge University Botanic Garden a few weeks ago, particularly around the lavenders. 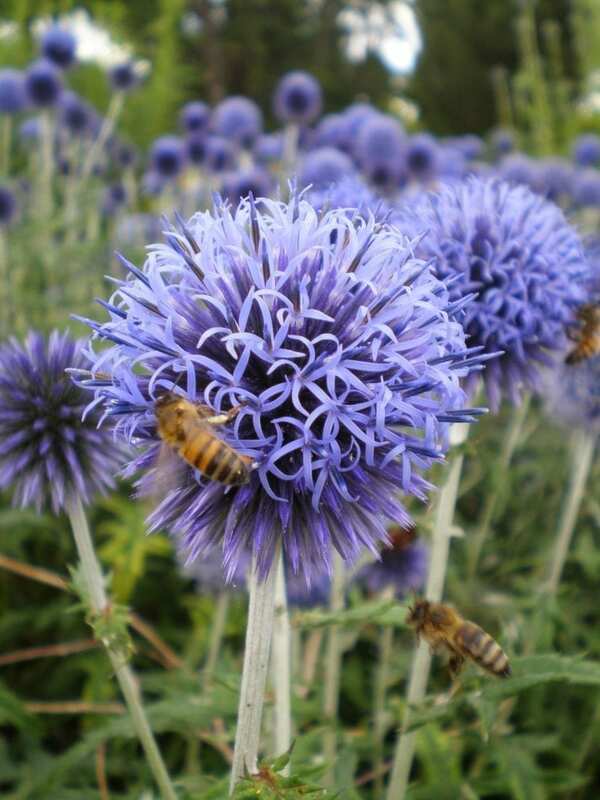 But they had many other beautiful flowers there, and I couldn’t resist these echinops. My trouble is that once I start photographing bees on flowers, I immediately fill my camera up with hundreds of slightly blurred images! At the start of the month Mike and I took our two kids to Mallorca for a week. I couldn’t resist taking this photo of dried lavender bags, which I’m sure contained French lavender not Spanish! Then last week Mike and I left our kids with Granny and had a week in Edinburgh for the festival – we went to rather a lot of comedy shows at the Fringe. It was a very memorable way to celebrate our 20th wedding anniversary, and not at all work-related! I remembered Greyfriars Bobby from my last visit at the age of 12!